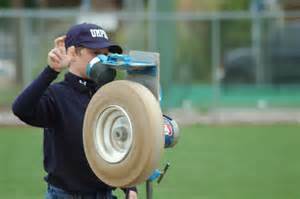 Most people would consider Pitching Machines to be a newer invention, but in reality the first machine was invented in 1897 by Charles Hinton for the Princeton University baseball team, but it’s reported it unfortunately caused several injuries to Princeton Coaches and may have been a contributing factor for Hinton’s dismissal as a mathematics professor. However, the machine did work and was capable of throwing variable speeds of pitches and with an adjustable breech size it could also throw curveballs. After tweaking the machine Hinton introduced it to the University of Minnesota where he was hired as an assistant professor. 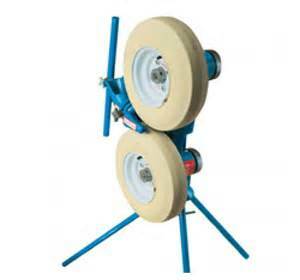 Current day pitching machines hardly resemble the early models and come in many varieties and styles, but they all tend to follow one of two delivery actions, the arm action machine or the circular wheel machine. The arm action machine delivers the ball with a spring loaded arm which is intended to resemble the overhand motion of a pitcher’s hand. This machine is excellent for teaching hitters to follow the pitcher’s arm, the mechanical arm, and for picking up the ball as it’s released. It’s major restriction, although speed adjustable, is the versatility to adjust to numerous types of pitches baseball and softball hitters are exposed to. The circular wheel machine can be as simple as containing 1 wheel or as complicated as a 3 wheel machine, which can be set in either a vertical or horizontal axis, and can be set, depending on the machine, for every type and speed of pitch thrown by a human being, including softballs. The machine, although a pitching machine, is not restricted to just throwing batting practice, as it can be set up to throw ground balls or fly balls, and can enable catchers to complete extensive workouts without disabling pitchers or coaches. Skilled and more experienced hitters often use a circular machine to refine their swing and to practice hitting high velocity and trick pitches, as depending on the machine, speeds of 100 mph can be attained as well as the throwing of breaking and off speed pitches. Whether buying it for self use or for an Athletic Association, unless you’ve bought one before or have extensive experience in their operating ability, I strongly urge you to go to a reputable sports store for assistance because of the complexity of some units and there’s no sense buying features you don’t need. The first thing which needs to be determined before purchasing a pitching machine is what type of play is the machine intended for? 3. A single wheel machine is more than enough to suffice a Back Yard workout, but if you’re extremely dedicated or at an advanced skill level, a two wheel, dual motor machine will offer greater varieties and speeds of pitches and could very well be worth the additional investment. Some Youth leagues use pitching machines in their younger age groups, as the logic is it will help hitters develop hitting skills because they’re not afraid of a wild pitch and the pitches are consistent, and some question if 8 years old is too young for the rigors of pitching. (1.) A single motor, 1 wheel machine, which is capable of reaching speeds of 60 mph, far exceeding requirements, is more than sufficient. (2.) Look for a light weight model which is easy to set up and transport as you must secure the machine in a building after the game and there will be transportation from one field to another. (3.) Be sure the machine works with both RIF and Standard baseballs, as you’d hate to think you got a great deal when buying the machine only to not be able to use it with your leagues baseball type. 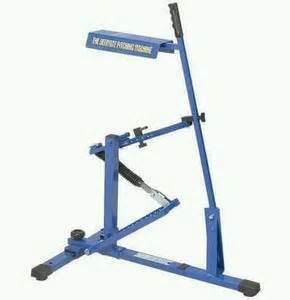 This level of play begins to demand a lot from the pitching machine and a two wheel machine is usually adequate, but the three wheel machine may be worth the extra cost as it’s capable of a larger variety of pitches and speed. (1.) Chose a machine which is capable adjusting to many different options. (b.) Throw a minimum of curveballs, change ups and fastballs of at least 90 mph. The three wheel machine reaches speeds of 100 mph and throws a variety of cutters, split finger, sliders as well as the standard curveball and change up, which will meet or exceed all expectations. (2.) Always be sure it’s easily set up and transport as no matter how good the pitching machine, if it’s a hassle to deal with it will not be used to its maximum benefit. 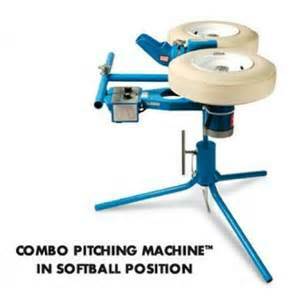 Softball pitching machines are unique coming with options specific to the sport. (1.) The machine should be built to release the ball underhanded. (2.) It could well be worth the extra expense to buy a machine which will accommodate slow pitch and fast pitch play deliveries, as well as throw risers and drop balls.